Last summer, the iconic work of Kehinde Wiley appeared at the Crocker as part of the traveling exhibition "Turn the Page: The First Ten Years of Hi-Fructose". Now, another portrait by the artist hangs in one of the Museum’s galleries — and this time it’s here to stay, thanks to the generosity of donors who helped fund the acquisition. The painting, "Portrait of Simon George II", is included in the exhibition "Hopes Springing High: Gifts of Art by African American Artists", on view through July 15. Though currently based in New York, Wiley grew up in South-Central Los Angeles. His mother enrolled him in weekend art classes as a child, hoping to keep him away from the danger and violence of the streets. Wiley recalls visiting museums throughout his childhood, including the Huntington Art Gallery, where he admired the collection of 18th- and 19th-century British portraiture. The Old Master representations of aristocratic power remained with him, and he would later reference them in his own work, adorning his paintings with ornate gold frames and replacing the figures with people of color in contemporary clothing. 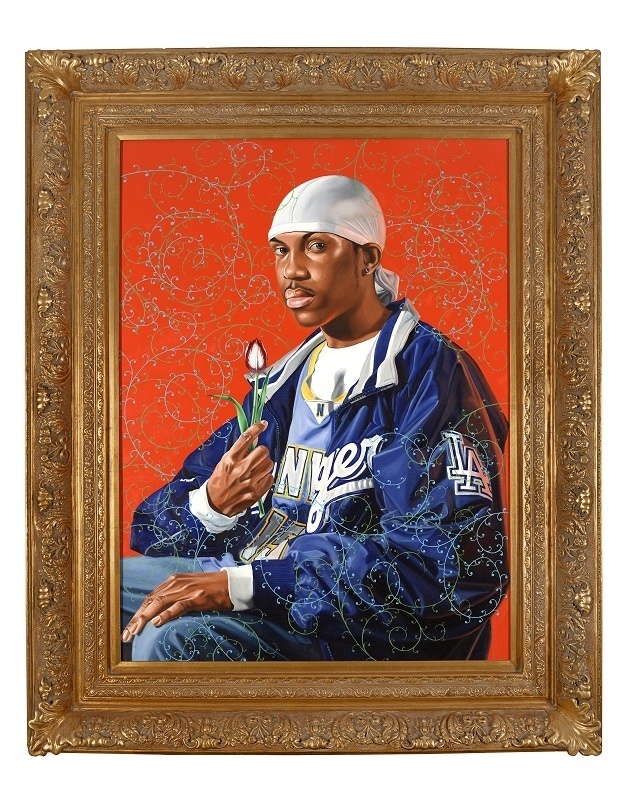 The figure depicted in "Portrait of Simon George II", for instance, wears a Los Angeles Dodgers jacket over a Denver Nuggets jersey bearing the number 15 — the jersey formerly worn by two-time Olympic gold-medal winner and 10-time NBA All-Star Carmelo Anthony. Like the artist, Anthony was a rising star at the time this painting was created, and the appropriation of his jersey seems to foretell Anthony’s later reappearance in Wiley’s 2014 "Modern Kings of Culture" series. Many of Wiley’s earliest works were self-portraits, and he maintains, “So much of what I do now is a type of self-portraiture.” Here, some speculation can be made about the words on the front of the jacket and jersey. They are partially obscured, but when combined with the “LA” lettering on the figure’s left sleeve, they seem to loosely spell Nigeria, perhaps adding a layer of personal significance to the painting in reference to Wiley’s Nigerian father, Isaiah D. Obot. After graduating from Los Angeles County High School for the Arts, Wiley earned his BFA from the San Francisco Art Institute in 1999 and his MFA from Yale University’s School of Art in New Haven, Connecticut, in 2001. He then worked as an artist-in-residence at the Studio Museum in Harlem, New York, where he began “street casting,” or asking the people he encountered to pose for his portraits. He would show potential subjects — specifically young African American men — images of Old Master works and ask them to select a composition in which to pose. Wiley’s international rise to fame came with "The World Stage" series, which he started in 2006 as he traveled around the world “street casting” men and, sometimes, women from Brazil, Senegal, Nigeria, India, Israel, and China. At first, the title of "Portrait of Simon George II" suggests a connection to the work of 16th-century German artist Hans Holbein the Younger, whose own "Portrait of Simon George of Cornwall" (circa 1535–1540) served as inspiration for other Wiley paintings. The pose, however, matches that of the sitter in Dutch artist Rembrandt van Rijn’s 17th-century "Woman with a Pink" in the collection of The Metropolitan Museum of Art. In "Portrait of Simon George II", Wiley has exchanged the woman in Rembrandt’s portrait for a man. Known for subverting traditional representations of masculinity and male beauty, this and other Wiley subjects compound the tension between “masculine” and “feminine.” Here, swirling, linear motifs contrast with the strength of this male figure wearing a do-rag and contemporary urban attire. Wiley also exchanges the pink carnation in Rembrandt’s portrait, a symbol of love and marriage, for a tulip, a symbol of luxury and wealth, with clear ties to the Dutch Golden Age. Wiley continues to enjoy international recognition and immense success. In 2014, just 10 years after his first solo museum exhibition at the Brooklyn Museum, he returned for his mid-career retrospective, "Kehinde Wiley: A New Republic". The Brooklyn Museum was the first of seven museums to host this show, which included 60 paintings and sculptures. In 2015, Wiley received the U.S. Department of State Medal of Arts from Secretary of State John Kerry for “substantive commitment to the U.S. State Department’s cultural diplomacy outreach through the visual arts.” Last October, he was selected to paint the official portrait of former President Barack Obama, which was unveiled earlier this year at the Smithsonian’s National Portrait Gallery in Washington, D.C.
Kehinde Wiley, Portrait of Simon George II, 2007. Oil on canvas, 62 1/2 x 51 in. Crocker Art Museum purchase with contributions from Denise and Donald Timmons; the Marcy and Mort Friedman Acquisition Fund for Contemporary Art; Marcy Friedman; Emily Leff and James Davis III; the Becky B. Krisik Fund; Linda M. Lawrence; Nancy Lawrence and Gordon Klein; Glenn Sorensen, Jr.; David Gibson and William Ishmael; and others, 2017.130. Courtesy of the artist and Roberts Projects, Los Angeles, California.